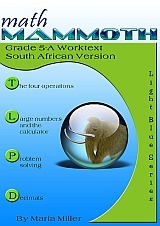 Math Mammoth Grade 5, South African Version is a complete maths program for 5th grade. It consists of two student worktexts (A and B), a separate answer key for each worktext, tests, mixed revisions, and in the download version, an additional worksheet maker (Internet access required) to make extra practice worksheets when needed. Please also see the table of contents for 5-A and 5-B (in the sample files), which will let you see the topics covered in more detail. The downloadable version includes a worksheet maker (Internet access required) that lets you make extra practice worksheets for many of the topics in the curriculum. The PDFs in the download version are enabled for annotation. This means that if you prefer, the student can fill them in on the computer, using the typewriter and drawing tools in Acrobat Reader version 9 or greater. The fifth grade is time for fractions and decimals, in particular. In part 5-A, we study decimals in depth and with substantial detail. Students also deepen their understanding of whole numbers, learn much more problem solving, and get introduced to the calculator. The year starts out with a study of whole numbers and their operations. Students get to revise multi-digit multiplication and learn long division with two-digit divisors. We also revise divisibility and factors from fourth grade, and study prime factorisation. In the second chapter, the focus is on large numbers and using a calculator. 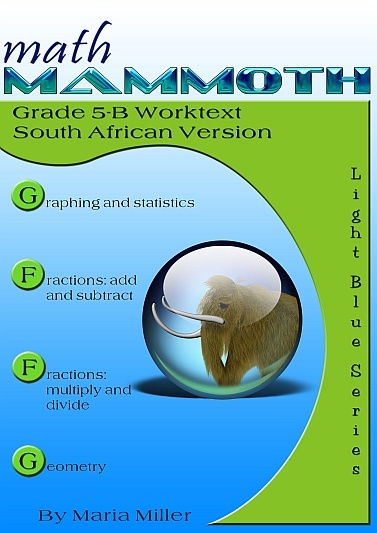 This is the first time a calculator is introduced in Math Mammoth complete curriculum—thus far, all calculations have been done mentally, or with paper and pencil. I want students to learn to be careful in their use of the calculator—use it with good judgment. Every exercise where calculator use is to be allowed is marked with a little calculator symbol. The third chapter is about equations and problem solving. We study simple equations with the help of a balance and bar models. The main idea is to get students used to the idea of an equation and what it means to solve an equation. Students also do a fair amount of problem solving using the visual bar model. The fourth chapter is about decimals and their operations. It is a long chapter because now is the time to learn decimal operations well. It is assumed that the student already has a solid foundation for decimal place value, as taught in Math Mammoth 4th grade curriculum. That is the true means of preventing common misconceptions, or students resorting to rote memorisation of the decimal operations. In chapter 5 we study graphing in a coordinate grid, line and bar graphs, and average and mode. Today's world has become increasingly complex, with lots of data in the media, so our children need a good grasp of graphs to be able to make sense of all that information. Chapter 6 is about the addition and subtraction of fractions—another focus topic for 5th grade, besides decimals. Students learn to add and subtract unlike fractions, using the technique of first converting them into equivalent like fractions. In chapter 7, we study the multiplication and division of fractions (division only in special cases), relying first on visual models, and then proceeding to the abstract shortcuts. Chapter 8 takes us to geometry, starting with a revision of angles and polygons. From there, students will learn to draw circles, to classify triangles and quadrilaterals, and the concept of volume in the context of right rectangular prisms (boxes). This product also includes an HTML page that you can use to make extra practice worksheets for computation, and a list of helpful Internet links for each chapter. Here is a list of manipulatives that are needed or recommended for grade 5. A ruler that measures in centimetres (for 5-B). A compass and protractor (for 5-B). Fraction manipulatives. The curriculum contains printables to make your own fraction manipulatives. The text uses visual pie models extensively, and students even learn to draw them for themselves for the exercises, therefore making or buying the manipulatives is entirely optional (optional; for 5-B). At Currclick. Currclick accepts credit cards and Paypal. You will be able to download the products immediately upon the purchase, and also return to your account at CurrClick to redownload.